SANTA MONICA, CA, USA: having made momentous musical waves with show-stopping premiere performances at The 2019 NAMM Show in Southern California, January 24-27, trailblazing pro audio manufacturer Antelope Audio is proud to speedily follow up on last month’s Orion 32+ | Gen 3 availability announcement by shipping its Orion 32HD | Gen 3 showpiece sibling. Since it is compatible with any DAW (Digital Audio Workstation) via HDX or USB 3.0, this new Pro Tools HD- and Native-ready audio interface really represents everything Antelope Audio stands for — from industry-finest AD/DA conversion, comprehensive connectivity, zero-latency monitoring, and 64-channel 24-bit/192 kHz audio streaming through to flawless clocking and beyond. 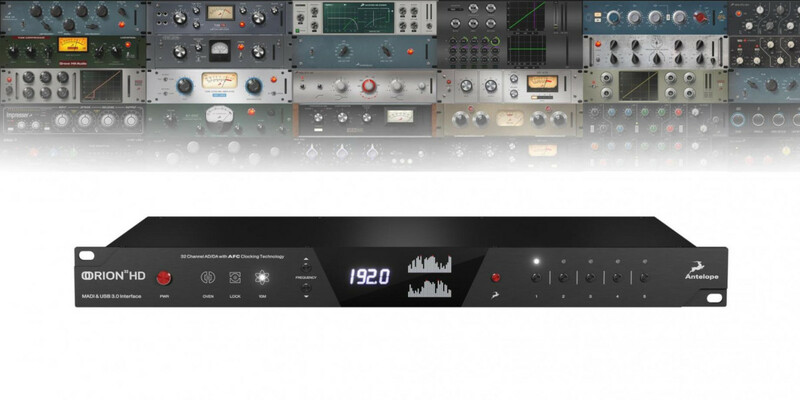 This third-generation, improved interface sets new standards in the pro audio industry by virtue of Antelope Audio’s acclaimed AD/DA being boosted to reach an astonishing 136dB of dynamic range! Like its innovative predecessors, Orion 32HD | Gen 3 is also an amazingly versatile audio interface. It works like a charm with any DAW on the market. Comprehensive connectivity makes streaming hi-res audio a digital delight, thanks to its back panel-positioned USB 3.0 Type B connector (offering 64 channels of I/O at up to 192 kHz) and also two mini HDX connectors for direct Pro Tools connection (each offering 32 channels of I/O, totalling 64 channels). Further flexibility abounds as digital I/O is also available over fiber optic MADI (IN and OUT — up to 64 channels each), two ADAT (IN 1 and IN 2, and OUT 1 and OUT 2 — both with up to 64 channels), and S/PDIF (IN and OUT) connections. Obligingly, Orion 32HD | Gen 3 not only enables users to stream an astounding 64 channels of audio when tracking, but also allows for multiple monitor mixes. Moreover, the sound is detailed, natural, pleasing, and transparent when monitoring. Meanwhile, stepping out into the wonderful world of analog audio, Orion 32HD | Gen 3 is equally well connected, courtesy of four D-SUB 25 connectors catering to 32 channels of ANALOG IN and four D-SUB 25 connectors catering to 32 channels of ANALOG OUT, plus two MONITOR outputs on 1/4-inch TRS jacks. Jet-setting, top-tier audio professionals as well as those working closer to home — or even at home — will, no doubt, delight in the unbeatable clocking accuracy of Orion 32HD | Gen 3 provided by Antelope Audio’s acclaimed 64-bit AFC (Acoustically Focused Clocking) jitter management technology. That should, however, hardly be surprising since Antelope Audio clocking has decades-long reputation for excellence in both stability and sonic improvement, insofar as transients will surely shine like never before and achieving a stereo image with incomparable depth and detail duly comes naturally. Needless to say, sonic perfection is clearly a given, with a crystal-clear high-end literally like no other! Orion 32HD | Gen 3 offers extensive flexibility for excellent productivity, providing a color-coded software routing matrix with four separate mixers, effects chaining, and zero-latency monitoring. All are found within an intuitive desktop application for macOS and Windows. It is even possible to use that intuitive software control panel from multiple computers connected over the same network to amplify an already flexible workflow! While the original Orion32HD set a new price/performance standard for HDX-compatible I/O, industry-leading conversion and exceptional connectivity for the price ensure expectations are redefined once again with the Orion32HD | Gen 3. It includes all the power of the original, now upgraded with Antelope Audio’s flagship-level AD/DA conversion. Combining all that with a refreshed design and a wide range of realtime, FPGA-powered effects ensure that the Orion32HD | Gen 3 will make productions and live shows shine forth for all to truly hear! Orion 32HD | Gen 3 is now available for purchase — priced at an RRP of $3,995.00 USD — through Antelope Audio’s growing global network of authorised dealers (https://en.antelopeaudio.com/dealers/). Or order online directly from Antelope Audio via the dedicated Orion 32HD | Gen 3 webpage (https://en.antelopeaudio.com/products/orion-32hd-gen3/), which also includes more in-depth information.